When you’re on the back of a horse, you’re living to a different rhythm. At first, the measured bouncing jars you, but as you get used to it, your body learns to balance. Your breathing, which may have started out tense and uneven, softens again, sinking into the spaces between hoof falls. All of this disorientation-turned-synchronization brings you more into the present moment, where there’s nothing else to do but experience this new pulse and look around at all of the colors and textures of life on the trail. 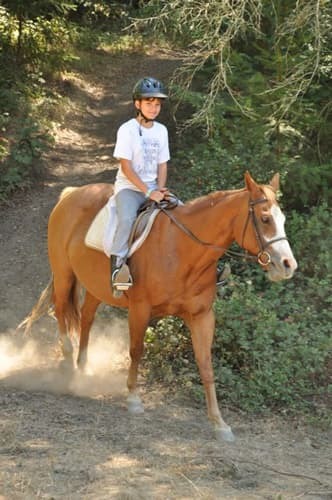 Some kids get to experience horseback riding only once a year at summer camp, but the activity is just one example of how the simple act of noticing what’s around you can inspire a state of mindfulness. The potential for mindfulness is unlimited—both in terms of how often we can exist in this peaceful, powerful state throughout our daily lives and in terms of how it can enhance our ability to make grounded, conscious choices. What Are the Real Benefits of Mindfulness for Kids? Kids are always learning. Anything they face is essentially brain food, be it a math problem, interpersonal conflict, or the choice to eat an apple versus Goldfish crackers. And the more kids grow in their awareness, the more they become the champions of their own learning. They can learn to channel energy toward activities and goals, to recognize when their emotions are in the driver’s seat, and to see that even when overwhelmed, they can approach one problem—one moment—at a time. Adults are also not the only ones who get stressed out. Kids’ stress responses can be triggered by the responsibilities of school, challenging social situations, their fledgling self-esteem, and even their parents’ stress. Most children don’t naturally have the resources to recognize what’s going on in these times of distress—but they can learn to be mindful. Developing closer connections with their experiences helps kids to recognize and avoid reactionary responses. Just don’t assume that mindfulness practice means sitting quietly for extended periods. In fact, there are plenty of ways to encourage mindfulness in your kids even during mundane events. Ask kids questions while they’re eating. Our relationship to food plays a more important role in our lives than most of us acknowledge. And, for a lot of kids, mealtimes just seem like an interruption to their play. They’re looking forward to being excused. But a conscious connection with what they’re eating can help kids take more responsibility for their food choices. Help kids to label their emotions when they get to be overwhelming. Adults get overwhelmed by their emotions too, but kids are still coming into an understanding of what those emotions are. And when we feel emotions intensely, we sometimes forget that they are just experiences and begin to identify with them instead. One simple way to bring emotions back into context is by labeling them: excited, sad, confused, angry, scared. When your child is stressed out and feeling overwhelmed by the experience, ask them questions or direct them to explore their experience with words: “I’m feeling worried and pressured right now about my math test later.” In this way, we’re not shutting off the experience of our emotions, but we’re finding just enough distance to process them and act from a centered place. Help kids perceive boredom differently. In our fast-paced, success-driven society, it’s difficult to spend time doing nothing. We have a hard time being “bored.” But, in a way, boredom is just spaciousness. Imagine all the possibilities for gaining awareness of ourselves and our internal landscapes! It’s hard to imagine because we’re so out of practice relating to this way of being, and our habits have us constantly looking for something to fill the space. So when your kids tell you, “I’m bored,” make a point of encouraging them to engage in that realm of spaciousness. Tell them, “Okay, I have an idea: Close your eyes and tell me three different sounds that you hear. . . Now, tell me if you can see a color or colors even with your eyes closed. . . Now, open your eyes and tell me where you see some of the same colors you could see when your eyes were closed.” If they need convincing, tell them they’re in superhero training to strengthen their “Spidey” senses. It’s not altogether a lie because this greater ability to connect to their own awareness is very real practice in being in the present moment. And this activity works anywhere: in the car, waiting for an appointment, or even just hanging out at home. Create morning rituals that help to move waking energy. “Intentionally creating a mindful morning for our kids can stimulate the prefrontal cortex of the brain, the part of the brain that allows them to think critically, solve problems, pay attention, and make good choices.” Dr. Kristen Race suggests preparing things the night before and getting up early enough so that mornings aren’t heavy with stress as you’re trying to get everyone ready and out. You can also help your kids develop routines so they can be responsible for their own preparation: ritually noticing what the weather outside is like so that they can make good clothing choices, checking to make sure they have their backpacks full of the basics, and slowing down to eat breakfast and connect with the food that will fuel their day. One great thing about summer camp is that it serves as a container for new and unfamiliar learning experiences. Camp is full of rituals that bring greater awareness to eating together, taking care of our community spaces, and honoring each other for all kinds of successes. But at home, even in the context of your regular routines, incorporate some of these exercises, and talk about it! Once kids have had chances to experience a heightened state of awareness, they have something to relate to if you begin to talk about what would otherwise be a fairly abstract concept. The ultimate goal is to guide kids toward conscious relationships with their experiences, their senses, their thoughts, and their emotions. If mindfulness is going to connect kids to their deeper wells of strength and resourcefulness, it shouldn’t be about retreating from the everyday; it should be about finding that awareness even amidst mundane activities. If you’re interested in the ways we encourage mindfulness at Kennolyn, give us a call. Camp can be the perfect place to kick off some of these great exercises in mindfulness, but don’t put it off until then—there is a lot for your kids to discover in those spacious moments!